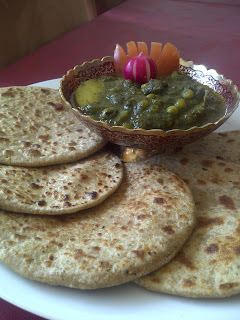 Again an authentic Indian recipe, paratha stuffed with Lentil. "Dal Bhari " means stuffed with lentil. A super healthy option using lentil and multigrain flours. I got some soaked additional Bengal grams from the last recipe which I thought of using it here. This recipe is best suited for lunch box or picnic basket. Generally wheat flour is used for this paratha but to make it more healthy and rich in fiber, I am using various grain flour. You can prepare it in advance and can enjoy it anytime of the day like a roll with some pickle or a gravy. 1) Mix all the flour, nigella seed and 1/2tsp salt and make a tight dough using water. 2) Heat some oil in a pan, crackle cumin seed, whole red chili and finely chopped ginger. Add soaked and drained Bengal gram, stir it for a minute. Add garam masala and salt cook it further for another minute. Add 1/2 cup of water and let the lentil simmer for 5-7 minutes covered. 3) Take out the cover and toss it on high flame until all the water evaporates and lentil is dry. Turn off the heat and let it cool. 4) Grind the lentil in a mixer to make a powdered stuffing. 5) Take some dough and roll in a round shape. Put 1spoon full stuffing in the center and try to put all the edge of the sheet together to make a closed pouch. Gently press it and roll again to make a round paratha. 6) Put in on a hot pan and grease it from both side to make a crisp paratha. 7) You are ready with the crisp and spicy paratha to go with any pickle or gravy. perfect chappathi rounds, very healthy too rite?